Somehow this book flew under my radar. 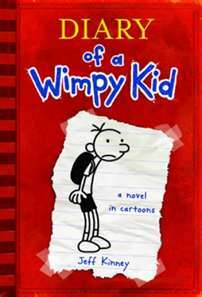 Since it came out, it has prompted a whole Wimpy Kid series and even a movie, but it just made its way into my hands today. It’s an easy read, I finished the whole thing in an hour, but I now understand the rage. It’s hilarious in a poorly grammatical, self-centered, middle school kid sort of way. Or the bright idea spawned from a Christmas Big Wheel disaster: “I found a way to have some fun with the Big Wheel Rowley got me for Christmas. I came up with this game where one guy rides down the hill and the other guy tries to knock him off with a football.” Let me wrap that episode up with two inevitable words: Broken Arm. Is this brilliant literature? Not by a long shot. It will never rate among my favorites, but kids gobble it up by the bucketful. Why? Because (and the teacher in me is cringing just a bit) it’s a grand slam fun read! Great review (and for the record I think these books are hysterical too)! I can see why the series is good at getting reluctant readers to read! It’s a fun read, but I don’t think I’ll venture into the rest of the series. I just wanted to see what all the hype was about. UGH! Don’t you hate it when they do that? Thanks, Tim. I’ve still got to get on there and take a look around. I’ve been meaning to read a Wimpy Kid book for a very long time. Whenever I’m in a classroom there could maybe be ten students reading the book…both boys and girls. I need to read it soon!